The terms 'On Duty', 'Off Duty', 'Status' and 'Roster' are used for the purpose of this support article. Your organization may have customized these terms. Please check with your Account Administrator to confirm which terms your organization uses with the 'Duty Manager' feature. Do not use any punctuation in association with the terms 'On Duty', 'Off Duty' and 'Status' (or the customized alternatives). Duty Manager will only work if you send the exact term via text that said, the terms are not case sensitive ( On Duty and on duty are both acceptable). 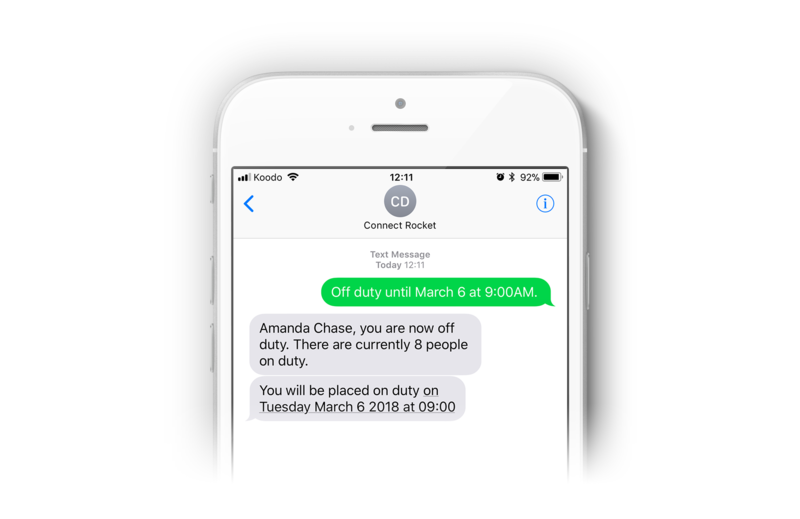 Text 'On Duty' to your organization's Connect Rocket phone number from the number you wish to manage. You will receive a reply text message confirming your status change to 'On Duty'. You will now receive all calls, text messages and e-mail intended for the number/profile in question. Text 'Off Duty' to your organization's Connect Rocket text number from the number you wish to manage. You will receive a reply text message confirming your status change to 'Off Duty'. You will no longer receive any calls, text messages or e-mail to the number/profile in question. "Off Duty for 3 hours"
Connect Rocket will respond letting you know that you are 'Off Duty" and confirming your return to duty date/time. In three hours, Connect Rocket will message you when you are automatically placed back 'On Duty'. Connect Rocket will respond letting you know that you are 'Off Duty" and confirming your return to duty time. On the next instance of 'Friday', Connect Rocket will message you when you are automatically placed back 'On Duty'. "Off Duty until tomorrow at 4PM"
Connect Rocket will respond letting you know that you are 'Off Duty" and confirming your return to duty date/time. The following day, Connect Rocket will message you when you are automatically placed back 'On Duty'. "Off Duty until January 15, 2018 at 10AM" or "Off Duty until Jan 15 at 10AM"
Connect Rocket will respond letting you know that you are 'Off Duty" and confirming your return to duty time. On January, 15, 2018 at 10:00AM Connect Rocket will message you when you are automatically placed back 'On Duty' Please note if you do not specify a year, that Connect Rocket will assume the next instance of a date. *Note: If you do not include a time, Connect Rocket will place you back on duty on the requested day at 07:00AM. This default time can be changed in your account settings. Text 'Status' to your organization's Connect Rocket text number from the number you wish to verify the status of. You will receive a reply text message indicating that you are either 'On Duty' or 'Off Duty'. Text 'Roster' to your organization's Connect Rocket text number from the number you wish to verify the status of. You will receive a reply text message(s) listing the names of ALL 'On Duty' Contacts.